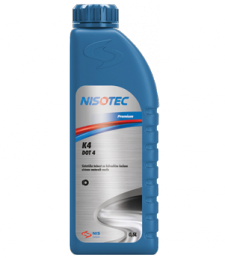 NISOTEC K4 is a synthetic brake fluid based on polyglycol esters and polyglycol ethers. Designed for hydraulic-transmission brake system of motor vehicles, which require recommended use of DOT 4 brake oil quality. Thanks to its low viscosity, it is recommended for brake systems with ABS and ASC-TV. Suitable for use in shock absorbers and similar hydraulic systems for which the manufacturer recommends this type of oil. Not to be mixed with mineral-based brake oils. 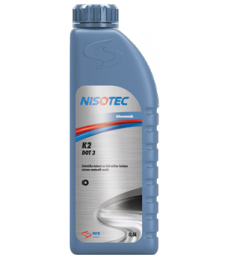 NISOTEC K2 is a synthetic brake fluid based on polyglycolic esters and polyglycolic ethers. It is intended for hydraulic transmission mechanisms for braking in motor vehicles of all types which are recommended to use brake fluid of DOT 3 quality. It can be used for both suspension and similar hydraulic systems for which manufacturers recommend this type of fluid. Not to be mixed with mineral-based brake oils.